Public-Lands Ranching: How Bad Is It? As noted in this post, there were approximately 82,000 wild horses and burros on western rangelands earlier this year, compared to 1.5 million cow/calf pairs or cow/calf equivalents (e.g., if they were all sheep there would be 7.5 million of them because one cow/calf pair = one horse = five sheep). 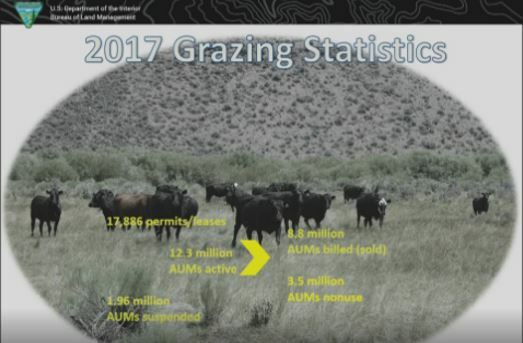 Wild horses and burros accounted for 1 million AUMs compared to 8.8 million AUMs for livestock. Are the livestock confined to HMAs and HAs? No. Do wild horses and burros stay inside the HMAs and HAs? No. But they all graze on western rangelands. If livestock AUMs were sold out, there would be over 2 million cow/calf pairs on western rangelands (12.3 million divided by 6). The BLM and USFS, along with the public-lands ranchers, want WHB populations reduced to AML, which is 27,000. They are pursuing that goal aggressively, with over 10,000 WHB removed from western rangelands this year. If they hit both targets, WHB would account for 0.3 million AUMs annually (27,000 times 12), while livestock consume 12.3 million AUMs. Two million cow/calf pairs (four million head), privately owned, on public lands, compared to 27,000 horses and burros. If they had their way, there’d be few if any horses and burros on public lands, taking the scheme to the limit. Keep in mind the ranchers pay $1.41 to graze a cow/calf pair for one month. You couldn’t feed a parakeet for that!